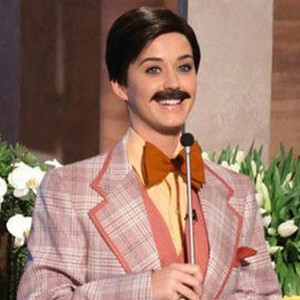 Katy Perry helped Ellen Degeneres celebrate her 55th birthday last week by coming on her show dressed as a male game show host. Male Katy hosted a game called “Grab Ellen’s Bust” which sounds inappropriate if you ask me. I wouldn’t know though. I turned off the video 30 seconds in because I was feeling embarrassed for some of the audience members and how excited they were getting. This entry was posted in Celebrity Steesh, Fake Steesh, Game Show Host Steesh, Musician Steesh, TV Steesh and tagged Birthday, comedian, comedy, Ellen Degeneres, entertainment, game show, game show host, Humor, Katy Perry, Moustache, mustache, mustaches, television on January 30, 2013 by Los Bulls.